Our simple bolt-on idler arm brace creates a double shear mounting point for the factory idler arm spindle shaft. It eliminates the side loading force generated by big tires bouncing off of big rocks! Cheap insurance against snapping the entire assembly off and becoming stranded. 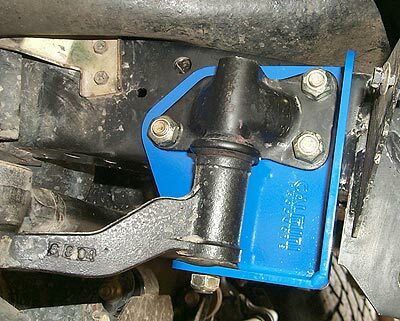 Designed to be used individually as our replacement steering system utilizes and incorporated idler arm brace into the idler arm assembly. The part is laser crafted for a perfect fit. Finished in signature CALMINI blue powder coat.